Today I celebrated the arrival of Spring with a little walk, and I’m insanely proud of myself. And then, with the help of a friend of Andy’s who was over this morning, I took my walker and WALKED TO THE CORNER. Walking to the corner is a very short space. It’s a length that most folks would just ignore, it’s so short from our house to the point where Hawthorne and Cypress meet. But I walked it, all the way, and then turned around and walked back. I only had to rest once, and when we got back I put my walker away and made it up the stairs to watch a little TV with Andy’s friend. All in all, an amazing day. I feel like an Olympian. I know Gerry would be proud of me, too. 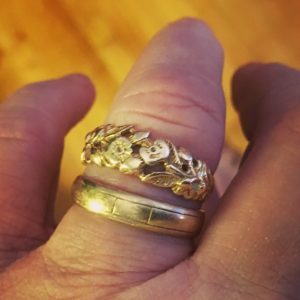 Today I feel that his wedding ring (which I wear along with my own since his passing) has an extra sparkle to it, or maybe that’s just the Spring sun I’m finally feeling on my hands and face! I know how silly this is, but the sense of freedom I feel just getting out of the house on my own is indescribable. A few months ago I could barely get into the car for a doctor visit, and once I did I was nauseous the entire car ride, and couldn’t hold my head up for the doctor’s appointment. So, for some folks it may be silly. For me this is about as serious as it gets. This entry was posted in Health, Lymphoma, Recovery by Annie Modesitt. Bookmark the permalink. What a great day! What a list of accomplishments! That’s wonderful! I’m doing my Snoopy dance in celebration! Not at all silly! That’s great news. Enjoy all the steps. Annie, I know exactly how you feel. I am recovering from cancer as well, and the first time I left the house in my walker was pure bliss. Enjoy the moment! There will be more as you regain your strength! It does not sound silly; it sounds like a slice of heaven for someone who has been through hell this past year. Congratulations! Peace (and continued improvement) to you, my friend. You are rock’s it and that is wonderful!!! So proud of you and your strength!!!!! Congratulations! Every small step is a winning one. The emotionally restorative power of fresh air and sunshine should never be discounted, IMO. Here’s to more walks in the future soon! Congratulations!! And thanks for sharing this good day — it gives me a lift just to hear about it, and I’m sure I’m not the only one. It’s a beautiful warm day where I live and I’m about to go for a walk. Even though I am almost 20 years past chemo, the experience still makes my walk extra sweet. I wish the same for you, dear Annie, when you are 20 years past chemo. Not a small thing- A big step forward. I’ve had that same feeling when recuperating and going out to walk to my corner- it renews one’s spirit. Little victories are the best! Be proud of yourself. Go you! 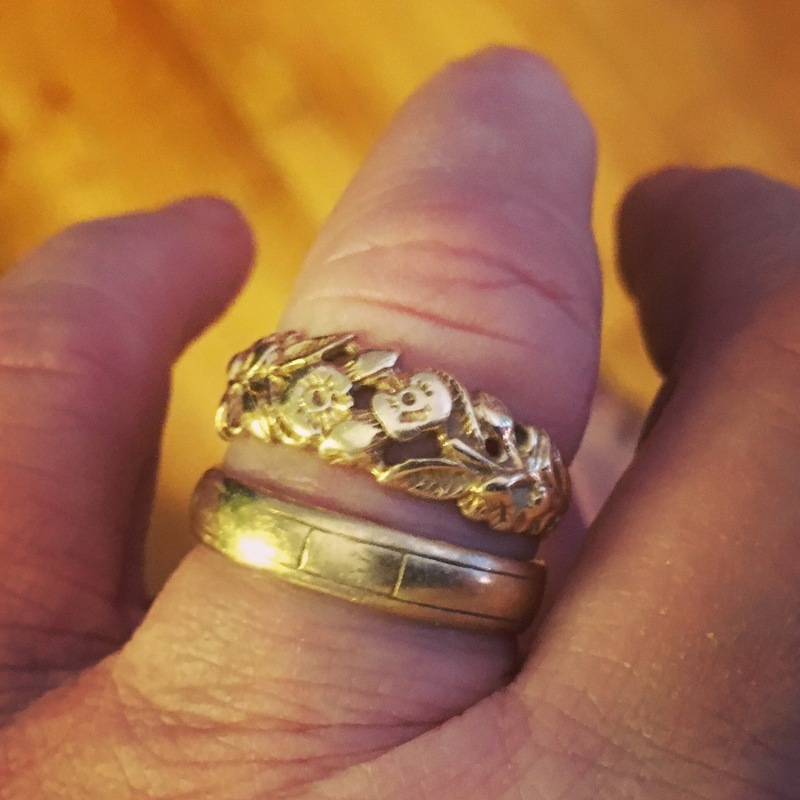 I love that you’re wearing Gerry’s ring – it looks great and must be of comfort.